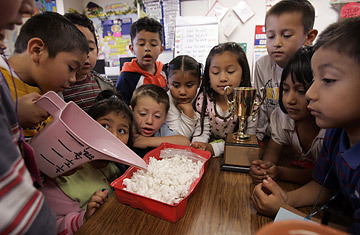 First-grade students perform an experiment at Las Palmitas Elementary School in Thermal, California. There was always something slightly insane about No Child Left Behind (NCLB), the ambitious education law often described as the Bush Administration's signature domestic achievement. For one thing, in the view of many educators, the law's 2014 goal  which calls for all public school students in grades 4 through 8 to be achieving on grade level in reading and math  is something no educational system anywhere on earth has ever accomplished. Even more unrealistic: every kid (except for 3% with serious handicaps or other issues) is supposed to be achieving on grade level every year, climbing in lockstep up an ever more challenging ladder. This flies in the face of all sorts of research showing that children start off in different places academically and grow at different rates. Now a former official in Bush's Education department is giving at least some support to that notion. Susan Neuman, a professor of education at the University Michigan who served as Assistant Secretary for Elementary and Secondary Education during George W. Bush's first term, was and still is a fervent believer in the goals of NCLB. And she says the President and then Secretary of Education Rod Paige were too. But there were others in the department, according to Neuman, who saw NCLB as a Trojan horse for the choice agenda  a way to expose the failure of public education and "blow it up a bit," she says. "There were a number of people pushing hard for market forces and privatization." Tensions between NCLB believers and the blow-up-the-schools group were one reason the Bush Department of Education felt like "a pressure cooker," says Neuman, who left the Administration in early 2003. Another reason was political pressure to take the hardest possible line on school accountability in order to avoid looking lax  like the Clinton Administration. Thus, when Neuman and others argued that many schools would fail to reach the NCLB goals and needed more flexibility while making improvements, they were ignored. "We had this no-waiver policy," says Neuman. "The feeling was that the prior administration had given waivers willy-nilly."